There is no copyright in titles and an awful lot of us seem to have written books called Just Desserts. Mine began with the death of a chef called Escoffier Savarin Smith who had been unwittingly ingesting female contraceptive pills which fatally upset the balance of his hormones. He ran a restaurant called “The Dour Dragoon” which was an act of homage to the ancient Hungarian Soho restaurant, the Gay Hussar. And I was dropped by Stein and Day but picked up by Scribner because I had the English effrontery to include an unintelligible cricket match in the middle of a picnic. It was all rather extravagantly complex and based on some fanciful but scientifically based thoughts from a variety of properly qualified doctors of medicine. The book was a riot of food and drink and I was particularly pleased with a champagne called “Bitschwiller” which had its own widow just like Veuve Clicquot and a character called Erskine Blight-Purley who was very loosely modelled on my friend Colonel Maurice Buckmaster who ran the French section of the Special Operations Executive in World War Two. The French rewarded him by making him the Public Relations Officer for all champagne. In the television adaptation he was played by the incomparable John le Mesurier. My Just Desserts was a romp and my character Simon Bognor of the Board of Trade was what nowadays in Britain is known as a “foodie”: a good trencherman who liked a drink on a cold day. He hasn’t had a whole book to himself for over fifteen years and I begin to wonder fondly if I should bring him back for an encore. I worry, though, that too much food and drink may have done him in. He smoked the odd cigar and didn’t exercise much either. In the meantime I’ve invented some more characters and continued to include more food and drink than is entirely decent. My friends ffiennes and Carruthers were created for the London Tatler magazine’s summer season special issue, which is actually sponsored by Veuve Clicquot champagne and celebrates a world fuelled on strawberries, caviar, smoked salmon and fine wine. ffiennes and Carruthers are not their real names. Instead they are the aliases for the two commanders of Scotland Yard’s Social Squad. The moment a Duke or Duchess is found dead in the library the word goes out “Send for Scotland Yard Social” and ffiennes and Carruthers arrive shortly afterwards wearing neckties from Eton and Harrow and generally exuding an air of bogus aristocracy. My other new character, Doctor Tudor Cornwall, Reader in Criminal Studies at the University of Wessex, is less of a gourmand and œnophile than Bognor, ffiennes or Carruthers, but in his first full-length adventure Death and the Visiting Fellow he does knock back a fair bit of sparkling shiraz, mainly from the Rymills winery in the Coonawara district of South Australia. I encountered just such a wine when I made the keynote speech at a tiny but perfectly formed literary festival set in Penola, the Coonawara’s capital. One evening at Rymills I drank this nectar in their huge barrel room during a performance of Cosi fan Tutte which reminded me of a ffiennes and Carruthers crime committed at an English country house during an experimental opera called I Papparazzi. I feel slightly guilty about this quartet of all eating, all drinking investigators because they have been a bit elusive. Bognor has been out of print for ages but the estimable Back-to-Print books are now re-issuing all ten of his full length mysteries, including Just Desserts. ffiennes and Carruthers have never moved from the pages of the Tatler, let alone across the Atlantic (“Too English, dummy!”) and although Doctor Cornwall has had an inaugural outing in the Strand Magazine he is still, at present, a character in search of a publisher. Were I to invite the four of them to dinner my wife would do the cooking as she thinks I make too much mess if let loose in her kitchen. She may be right but I like a bit of zest and panache while labouring over a hot stove. As it happens we have guests tomorrow and she is giving them a cheese custard and parmesan crisps with a tomato coulis followed by salmon koulibiac with some sort of green vegetable purée and a winter fruit compote with cinnamon ice cream and walnut biscuits. Serious stuff. Wines to match. I have an interesting looking sauvignon blanc from South Africa called Mitchell’s Pass which I’d like to try. Left to ourselves, however, I think Bognor, ffiennes, Carruthers and Cornwall would indulge in something simple, even rustic. I think we’d cook pasta. Spaghetti in water with a ladle of good olive oil and a pinch of salt cooked at a rolling boil for just eleven minutes. Or maybe shells or tubes of penne which are less of a fiddle to eat. As a dressing I’d be happy with nothing more elaborate than aglio e olio—several cloves of finely chopped garlic warmed through but definitely not browned in plenty of the very best extra virgin olive oil. I might experiment with the oil and try something from the Barossa Valley or McLaren Vale. And the Wine Society’s Montepulciano will do just fine. A good pepper mill on the table is a must. If we’re feeling a little more adventurous and extravagant I might buy a bottle or two of the best Coonawara Cabernet and help the oil and garlic out with chilis, capers, anchovies or even clams or prawns. I’d particularly favour the chilis but only if I could get serious New Mexican ones like those I used to enjoy at the Rancho de Chimayo outside Santa Fe all those years ago. In fact, come to think of it, please can we lunch out there? We’ll cut the wine and settle for those amazing iced margaritas. Oh and sopaipillas with honey to cut the heat and the alcohol. Table for five. Sir Simon Bognor’s treat! When I was in my early thirties, many years before I started writing, I read a book by M.F.K. Fisher in which she stated that she remembered her entire life in terms of the food she’d eaten. As one of the world’s preeminent food memoirists, that made sense. But it also struck a chord deep within me. (As an example, I can remember what I prepared for dinner the night we finished wallpapering the bathroom in our present house, and that was twelve years ago. You don’t believe me? It was curried eggs on toast. Would I lie about something like that?) At the time I read Fisher’s words, I’d been a working chef for almost eight years. Food, music and books were my passions, but food had always come first. My mother wasn’t a particularly imaginative cook. She never poisoned anyone, to my knowledge, but her food tended toward the bland, the necessary day to day meals, with very little interest in moving beyond meat and potatoes. A green salad at our house would have been considered exotic—if it had been considered at all, which it rarely was. But when it came to restaurants, my mother was a Titan. When I was thirteen, mom and I traveled to New York. I still remember my first taste of lobster. My first flaming crêpe suzettes. My first Caesar salad at Sardi’s. Between wonderful meals, we went to Broadway shows. Let me tell you, this kid was in hog heaven. The love I have for cooking, however, came from my grandmother. She always prepared Christmas dinner for our family and believe me, it was a feast. Roast turkey. Candied sweet potatoes. Homemade rolls that melted in your mouth. Sandbakkelse. Spritz cookies. Meringues. Homemade pies. (Does no one eat mincemeat any more!?) Floating Islands. Lemon Schwam Tortes. Meatballs baked in a browned butter gravy that were so good, it made you want to join the Norwegian army. Ella Anderson was a tiny Norwegian woman with a sunny smile, a happy disposition and a love of opera. I remember her so clearly sitting at the grand piano in her living room, peering over her bifocals at the music in front of her. In her old age, it was always a hymn. As a young woman growing up in a small town in North Dakota, she played the background music for silent films in the local movie house. She loved to tell the tale of the time she fell off the stool during a particularly emotional moment. At twenty-two, she married a banker and moved to his “claim,” but she was never a very good pioneer. I come by my lack of “pioneering spirit” honestly. Grandma was such a good cook that she made her incredible food without the need for recipes. As a child, this amazed me. I should preface my story by saying that the higher one climbs on the ladder of chef-dom, the less one relies on recipes. An executive chef at a fine restaurant will look at what’s in season, what’s available, and will combine those elements with his or her own creative style to develop the weekly menu. That being said, the one area in which recipes are always used, even by professional chefs, is in the pastry department. Without an exact formula, baked goods turn into disasters. Not so for my grandmother. She’d made so many cakes, breads and cookies in her lifetime that she could tell by the look and feel of a dough or batter if it was right. This still amazes me. In college, my friends and I—often after one too many glasses of wine—would retreat to the kitchen to prepare chocolate chip cookies. We never had a recipe, so bolstered by the wine, my personal megalomania and my grandmother’s example, I’d toss in what I thought made sense. Flour, sugar, butter, eggs, chocolate chips, salt—some kind of leavening. We usually baked one huge cookie. It never came out exactly right because I’d get the measurements wrong, but hey, in our altered state we thought it was ambrosia. Perhaps that was the beginning of my culinary career. If so, I am suitably ashamed. Since just about everyone in my family (except me) is crazy in some idiosyncratic way, I’ll finish my grandmother’s story by saying that her eating habits disintegrated as she got older. Because she suffered from colitis, a disease that no one in the family ever understood, she insisted that her doctor had cautioned her to only eat white food. Thus she survived for many years on white bread, vanilla ice cream, mashed potatoes, chicken, milk, and an occasional marshmallow. When it came time for me to write my first novel, it was a given that the main character would have culinary leanings. I followed the old maxim that says to write what you know—and what I knew was food. I should mention here that I write two mystery series and that I’m currently at work on my eighteenth book. The Sophie Greenway/Bram Baldric series is niche marketed as a culinary mystery, the Jane Lawless series as a gay amateur sleuth. Leaving aside what I think about niche marketing, both of these mystery series have a lot to do with food. I’m always delighted when someone comes to one of my signings and tells me that my books make them hungry. I suppose that’s because I’m fascinated by food references in other people’s books. (Nora Ephron’s cheesecake recipe in Heartburn comes to mind. I’ve made it dozens of times.) And then there’s Miss Marple’s comment that, when it comes to muffins, “Americans have a lot to answer for.” When I eat a muffin, I always remember that quote and laugh. I also buy and read cookbooks with total abandon, especially when I’m on a diet. Call it masochism, but it works for me. The cookbook shelf in my study almost rivals the mystery shelf. To combine a mystery novel with food is, in my humble opinion, much like combining hot fudge and vanilla ice cream—or goose livers, butter and cognac. They were meant for each other. By the way, don’t ever let a writer tell you that his or her writing isn’t an inexpensive form of therapy. In my novels I’ve bumped off a few nasty chefs, egomaniacal reviewers, and sociopathic ex-husbands. Of course, any resemblance to persons living or dead is entirely coincidental. And the sky is orange. This Little Piggy Went to Murder was the first book in the Sophie Greenway series—”Nick and Nora for the new millennium,” as some have called it. Yes, they drink dry martinis. Yes, Bram is suave. Yes, the banter is occasionally humorous. And yes, they have a dog. But Sophie, with all her goofy determination, is the main sleuth. I’m not saying Sophie is goofy, but she does get herself into some odd situations. Let’s see, there was death by cheese ball, death by cheese puffs… hmm. I seem to notice a pattern. When I first started writing the food series, I thought I was headed in a different direction—that the book would be titled for nursery rhymes. Hence the second title, For Every Evil. (“For every evil under the sun, there is a remedy or there is none,” etc.) When the second novel was finished, my editor told me to “beef up the food parts.” I found this a bit enigmatic, but always willing to comply with my editor’s wishes, I did it. I didn’t understand until some time later that, because Sophie was a restaurant critic, Ballantine had decided to market the novels as food mysteries. That’s why I didn’t include recipes in the books until the third installment. But just like the kid who visited New York at the tender age of thirteen, I am once again in hog heaven. I get to combine my love of food with my love of mysteries. The newest book in the series, Dial M for Meat Loaf, contains one particularly wonderful recipe—Cora Runbeck’s No Nonsense Meat Loaf. I worked on that one for months, and I really do recommend it to any carnivore who loves old-fashioned comfort food. I claim total ignorance as to how I came to be a writer of what are known as Culinary Mysteries. I sometimes can’t imagine how I came to write any sort of novels at all. I was not one of those clever souls who knew from the age of six that she was destined to be a writer. In fact, as I recall my childhood, I took every opportunity to avoid writing. Now, reading, on the other hand, was a different story. I loved to read, plunging through everything I could check out of the Northwest Branch of the Chicago Public Library. I read mysteries in particular with great enthusiasm. Erle Stanley Gardner, Dame Agatha, Dorothy L. Sayers and John D. MacDonald. Anyone, in fact, who had a long, long series, with great characters and irony and humor. But writing? I’m afraid writing seemed an awful lot like work to the younger me. Actually, it still does. But back then, I was much better at figuring out how to avoid it. It was this same work-wariness that made me suspicious of cooking. Fear of chores kept me from learning how to prepare anything more rigorous than a four-minute egg until, a few years out of college, I met my husband-to-be. One giddy evening with a cookbook and a chicken, and the dear man was praising my culinary skills for hours. No fool he. For with such an appreciative audience, I soon began to take recipes and ingredients seriously, indeed. Soon I discovered the creative way one could have in a kitchen with just the right batterie de cuisine. I embarked on a fulfilling cook’s journey of discovery—including, in no particular order, the acquisition of a Cuisinart, a set of Le Creuset pans, and a marriage certificate. But surely I digress. So how did a non-writing, non-chef come to create culinary sleuth Madeline Bean and her partners-in-creme, Wesley Westcott and Holly Nichols—all three gourmet chefs and event planners at work in the Hollywood Hills? In lieu of embarking on an expensive course of psychoanalysis, let me simply present a bit of my background here and now and perhaps some picture will emerge. My upbringing included a working mom with many talents, such as bookkeeping and tap dancing, but not taken with an interest in fussy cooking. She provided quick and wholesome, if trend-free, meals. Nor does my formal education provide many clues: I studied Theatre in college, and took a minor in English; being prompted by a mother who thought girls couldn’t go wrong if they obtained a Teaching Credential. But inevitably, I swerved off that good girl course, looking for adventure out West. Between acting classes and auditions, I had plenty of adventures, but living in L.A. required some form of income. In that notoriously odd town filled with any number of odd jobs, I latched onto what has to be one of the oddest—writing game show questions. Who knew there existed a field where workdays started after ten, lunch hours stretched easily half the afternoon, and which required only a way with words, a razor sharp researcher’s eye, and a wardrobe of assorted pieces of clean denim? I enjoyed the camaraderie of fellow staff writers who ran the gamut from irascible fallen intellectuals to out-and-out loons, writers I came to recognize as “my people.” I delighted in finding my quirky niche in Hollywood. I began to worship the Writers Guild of America Health Fund and learned to believe in the heaven that is named “Residuals.” What could be more to my liking than the job of a game show staff writer, where I was given my own office, my own VCR and TV, and a subscription to People magazine? I don’t know if researching and composing cleverly worded questions for network shows was really what anyone could call “writing,” but if it was, I was prolific. In short order, I had several hundred thousand game show questions under my belt, and anyone who would like to challenge that number has only to dig through the cardboard boxes in my garage. These cartons contain thousands upon thousands of index cards dating back to my gigs as staff writer and head writer on over a dozen game show series. You’ll find questions there that I wrote for “Jeopardy!” (in categories such as—take note, Freudians—Potent Potables, Funny Foods, and Women Writers, among hundreds of others) and gourmet multiple-choices used in “Supermarket Sweep,” a cross between a culinary quiz and legalized looting. In addition, I also wrote other short things. I wrote sketches for comedians, like a Church Lady and Hans & Franz for Dana Carvey, a Judge Judy for Cheri Oteri, and a Liar for Jon Lovitz (Yeah—that’s the ticket! ), and many more. As time went by, I began to wonder if, aside from all the laughs, something was missing. I wondered if there might not be more to life than could be summed up by a dozen old cardboard boxes filled with dated trivia. In short, and at long last, and truly much to my surprise, I discovered that I had learned to work hard, and I was ready to work on something that was important to me. I enrolled in a course at the UCLA Extension Writers’ Program on how to write a mystery. I wondered if it were possible to write a Miss Marple story but set in the big bad city, instead of charming St. Mary Mead. And so, following a path that was anything but direct, I began to be a writer. What inspired me to include a food occupation for my amateur sleuth when I started Sympathy for the Devil back in the fall of 1993? For one thing, cooking is luscious. The sound of sizzling sesame oil, the pungent aroma of roasting garlic, the blast of heat from a wood-fire oven, and the vibrant reds and greens of fresh produce provide a rich palate of sensuous details from which to paint the backdrop for my stories. Fine meals and original parties are just plain fun. But, just because Madeline works in the food world, I hope readers won’t mistake her as simply frivolous. I am drawn to lighter mysteries that are witty and charming, but I also try to make sure mine are not too sweet. I take care to offset the party swirl with what goes on behind the scenes: the hard work of it. And I’m particularly interested in exploring the everyday struggle my young protagonist Madeline faces just to survive each day in Hollywood with her integrity and humor intact; to stay “real” amidst the unreality. To that end, Sympathy for the Devil takes place at an over-the-top Halloween party at a beautiful Los Feliz estate, but the story has its bittersweet notes. Among the cooking and the flavors, the characters must deal with the clashing of dreams, with hope and with death. Like a daring recipe, I try to stir in a surprise or two, including historical back-stories and deeper themes, and hope the concoction doesn’t collapse when it comes out of the oven. While it’s always enjoyable to write about good food, I’ve discovered quite a lot about professional cooking in the course of my research for this mystery series. I’ve had the honor of meeting and observing a number of Los Angeles’s top chefs, and their real life work is often grueling. As a result of my studies, the culinary details of Madeline’s work life are not dainty, either. I picture the chefs at work in Mad’s industrial kitchen attending their dishes in progress with the same intensity as, for example, ER doctors approach their work in hospital emergency rooms. But with slightly less blood. I see my fictional cooks as a team of pros, their hands graceful, powerful, always busy. Their eyes are ever on their chopping blocks, as they converse, joking around one moment, or solving last-minute problems the next. In this way, the scenes of food preparation in the Madeline Bean mysteries try to reflect the same hard work and concentration I’ve observed in the restaurant kitchens. 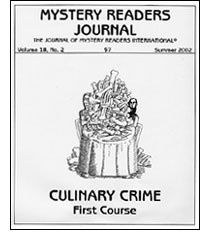 Of course, back in 1993, I was too naïve to know that there was a budding sub-genre of mysteries that centered on foodie occupations. Instead, I was solving problems that each writer must face. I knew I wanted to write about a young woman coming to Los Angeles and struggling to carve out a career. Frankly, a lot of the delight in writing these books is getting to skewer a few inflated Hollywood egos along with the shish kabob, so I needed Madeline close enough to observe all the odd goings on from the front row. As a caterer and party planner, Maddie has the perfect seat. While setting a mystery in the world of ingenious parties provides enough raw material to write a long, long series, it was more than mere strategic planning that drew me to writing about a professional cook. Since that one successful roast chicken long ago, I have become a real fan of great cooking. I find everything from recipes to special ingredients fascinating. As an amateur chef, I have for years collected cookbooks and antique dishes. I love cooking classes. I adore Williams-Sonoma catalogues. I admit freely, I am a big-time fan of Martha Stewart. By setting my mysteries in the world of the culinary, I have the perfect excuse to indulge my interest and continue to learn. For example, in Immaculate Reception, I was able to explore homemade breadmaking. Doing research, I had the great pleasure of meeting Jesuit Brother Rick Curry and discovering his simple and inspiring cookbook. This led to a year of kneading dough by hand, experimenting with yeast, and learning to look inward and meditate through each homey step. On the way, I came upon the method to produce wonderful brioche and also the ideal central baking scene for my second book. And so it goes. In the third, Killer Wedding, I shared culinary secrets discovered while making ice cream with my little chef, Nick, including our trick of using sour cream to enhance the deep flavor of chocolate. For my fourth book, Dim Sum Dead, I took a tour of all the delightful Dim Sum specialties my city has to offer, in the name of research. For the fifth Madeline Bean mystery, Food Freak, I have been baking cakes and getting into the world of cake decorating with wild abandon. Sometimes, things are just meant to be. I am thrilled to be writing mysteries that allow me to express my conflicted and passionate view of life, poke a little fun at Hollywood, and take on much more serious issues like justice and evil. I have somehow found myself doing exactly what I love to do, hard work and all. I’m writing material that really matters to me, material longer than a game show question—much longer—and I couldn’t be happier. Somehow, without a lot of premeditation, my late-blooming avid interest in cooking sparked a decision to throw the world of catering into the pot, as well. Now, I feel fortunate the world of culinary arts found its way into my books. I’ve grown to realize how the inclusion of the sensuous, tempting, delicious details of cooking seem to balance the difficult issues raised in books that deal with life and death. For many of us, the simple comfort we find in good food and drink helps us deal with the stress of our daily drama. I hope that same comfort is available to readers of the Mad Bean books—that no matter how difficult the road to the solution of the crime, there is always a tender morsel of something good to eat to sustain one along the way.